Your mission is to navigate your ship to the exit of each level. Guide your starship and blast everything that comes at you. In this huge Flashgame you are flying a spaceship in an unfriendly environment. Don't miss our caricatures of video game classics (level code: "oldmeetsnew") or the '18 Chambers of outer space' - the extra demanding final screens ("nowdifficult"). You can die because of two reasons. Either you loose your energy due to heavy damage through enemies or surrounding elements, or you run out of fuel. Your goal is to get through the levels as unharmed as possible. The damage you take through your surroundings are heavily influenced by your current velocity. Notice that there are several power-ups to restore fuel or energy or to reload your guns. You can use the guns to fight enemies or to remove some obstacles from the environment. Use the arrow keys to navigate the ship in the desired direction and press the spacebar to fire a missile. 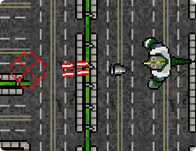 Note that with the arrow keys you are also controlling in which direction the missile will fly.